One of the challenges for any online instructor is making students feel a sense of community or connectedness in their online course. There are multiple strategies that can be put into place to meet this challenge head-on. Today’s blog post will focus on the feedback the instructor gives in an online course and how it can connect the student more personally with the instructor. The type of feedback an instructor provides can have a tremendous affect upon the student/instructor dynamic in an online course. Students who feel like they know their instructor report higher satisfaction levels and tend to be more engaged with the courses they are taking. Conversely, students that don’t sense instructor presence in the course tend to feel less satisfaction and engagement, and that can be reflected in course evaluations. Be purposeful about leaving feedback that deals specifically with aspects of a student’s submitted work. A side-effect of a good best practice to save time for online instructors is that sometimes generic feedback can be used to a fault. The online instructor can counteract this by leaving specific feedback about the students’ attempt every few assignments. 2. Use student names when leaving feedback. Starting assignment feedback with a student’s name immediately personalizes the interaction. Placing emphasis on the personal before leaving the feedback of the assignment, points to interest on the part of the instructor in the student’s individual attempt. The idea that an instructor cares about student success is vitally important in any course, online or otherwise. 3. Use multimedia to personalize the interaction. To a student sitting at their workstation/laptop/tablet, a grade or text-based feedback in an online course can seem almost sterile and devoid of the human touch that comes from the professor handing back grades in a face-to-face course. Luckily, most LMS’s these days come with tools that can make the feedback interaction more personal. Just the sound of the instructor’s voice will add a personal dimension to the feedback experience. 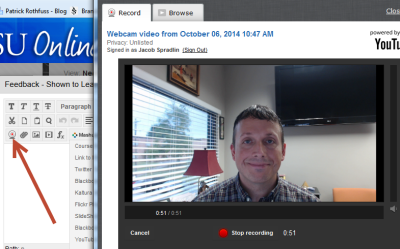 The addition of video to assignment feedback kicks it up a notch! 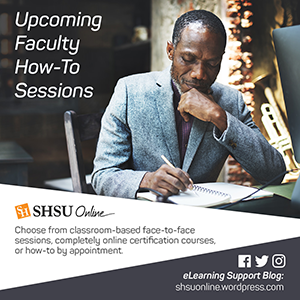 At SHSU, Blackboard is the Learning Management System for online, hybrid and web-enhanced course offerings, and it comes equipped with tools that can enhance the feedback experience. It also interacts well with third party tools and other types of files that can fulfill the same type of need for students. 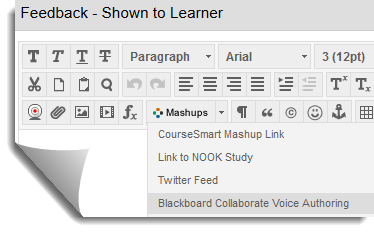 For example faculty can use the Blackboard Collaborate Voice Authoring Mashup to leave audio feedback directly in the feedback of the assignment. As a bonus a student is not just limited to hearing the disembodied voice of the online instructor for feedback. Faculty members can also use the Video Everywhere tool to drop a recorded video into the feedback shown to the student. The Video Everywhere tool utilizes YouTube to either link to a video uploaded to the instructors YouTube account or record a video at the point of feedback and place it directly. If the instructor does not have ready access to a webcam or microphone on their computer, he or she can record a video with their smartphone and upload it to YouTube as an unlisted video, then link to the video with the Video Everywhere tool. Instructors can also use voice recording apps to attach audio files to feedback for online students. Personalizing feedback for an online course is an important best practice for any instructor. However, personalizing every feedback entry for every student would take too much time away from grading and other important interactions. As with all things, moderation is key. Try provide a few personal interactions for each student, each semester, letting them know that the instructor is committed to their success and is willing to connect with students on a more personal level.